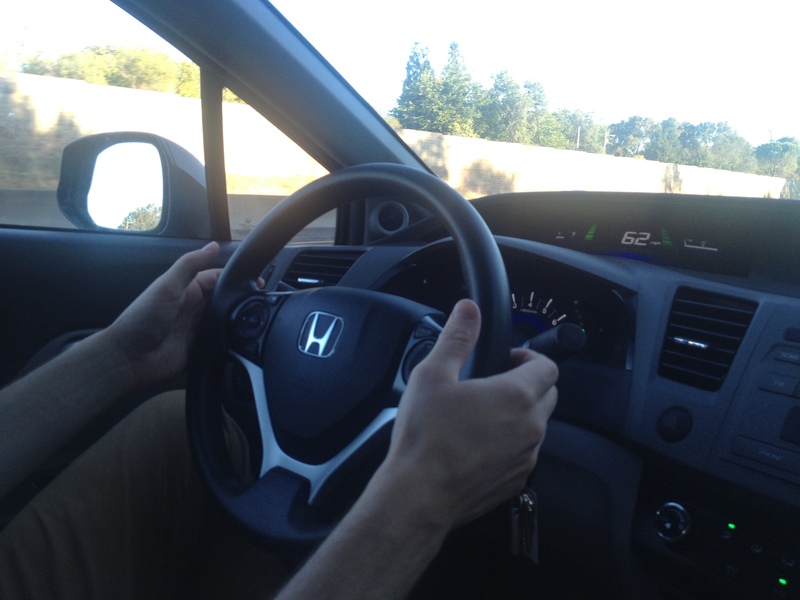 Have you ever wondered what your steering wheel grasp says about your personality? 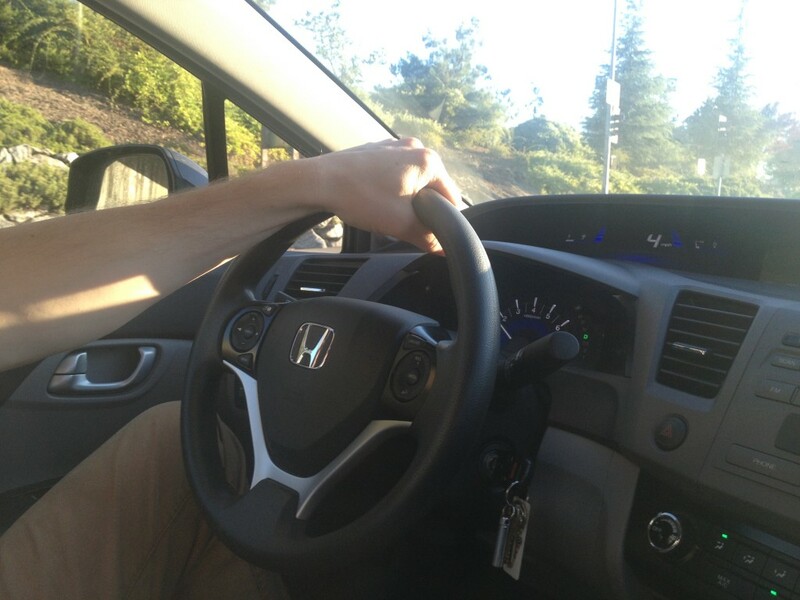 Through a clinical trial, scientists have discovered that the way you hold your steering wheel says more about you than you might think. 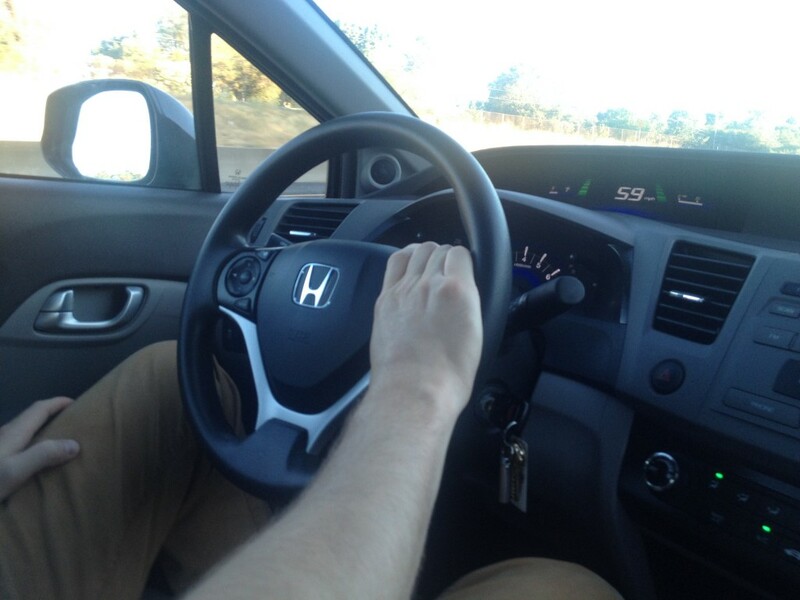 I took some selfies the other day to demonstrate each steering wheel holding method and what it says about you. 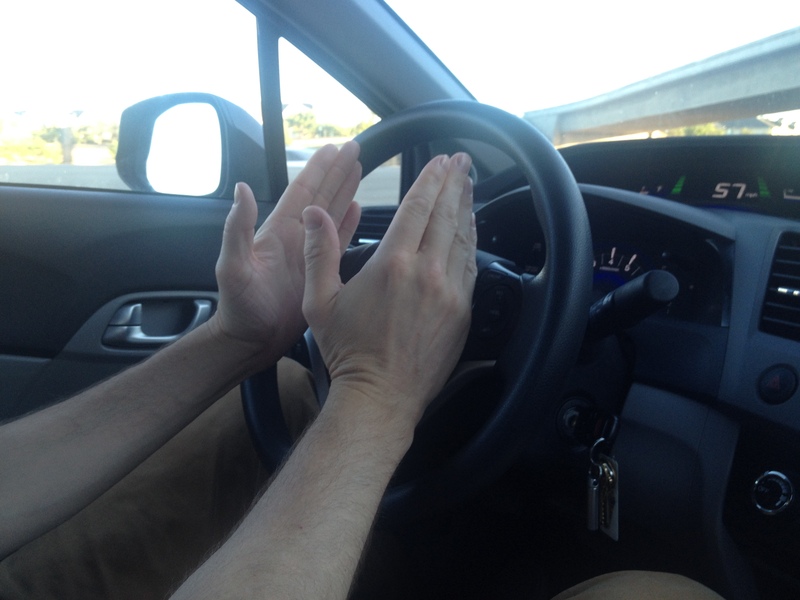 Before you begin reading, it might be helpful to drive around for a few minutes to determine your dominant hold. 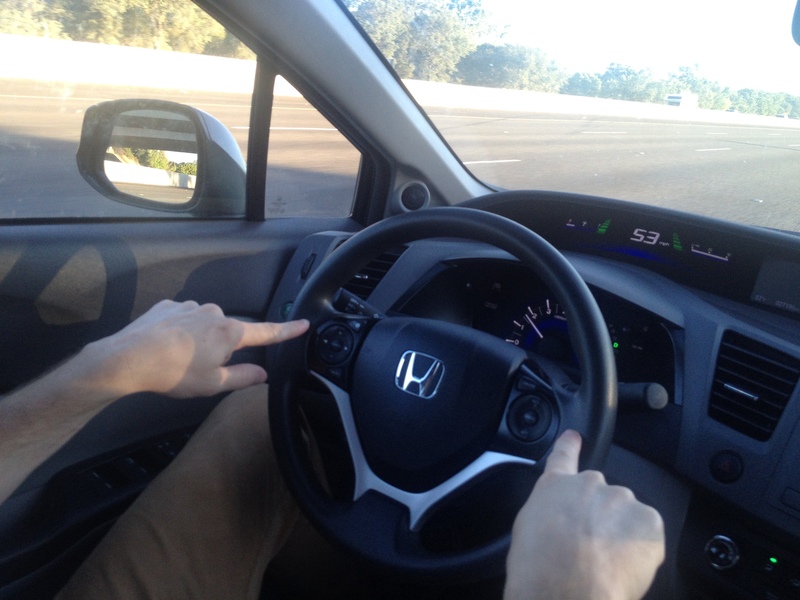 Using this driving method, you are screaming out to the world that you are a law-abiding citizen. 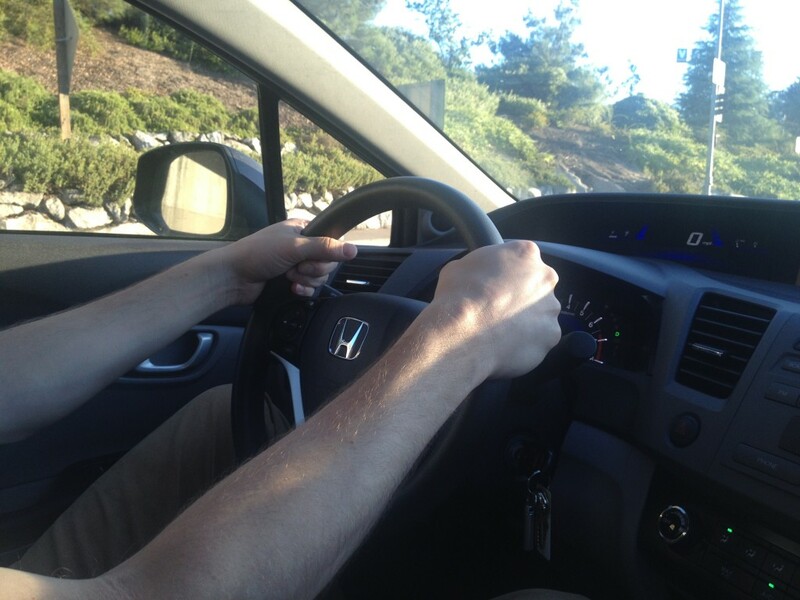 This classic Driver’s Ed hold places you at the upper end of the top 1% of drivers, making you a superior driver, and one the 99% despise. You are cool and you know it. 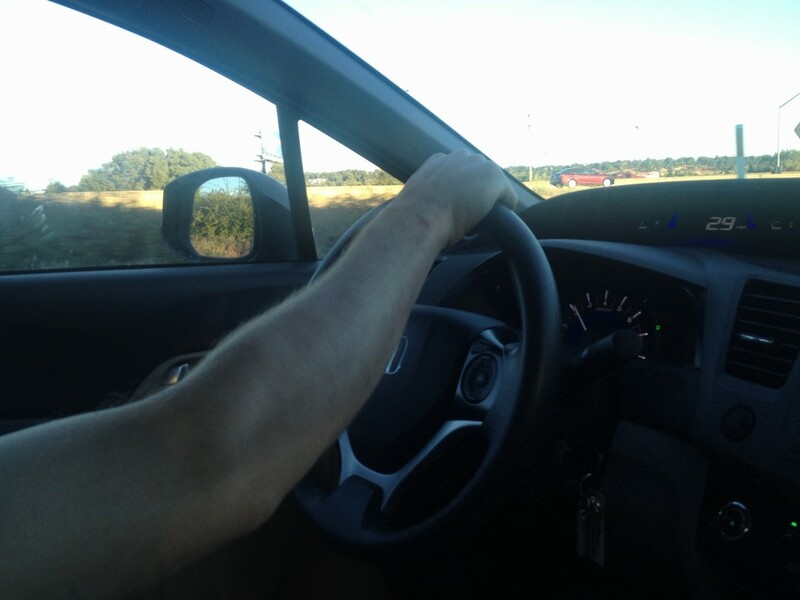 I try to drive like this when people are watching. When a cop is behind me, I quickly change to #1 above. 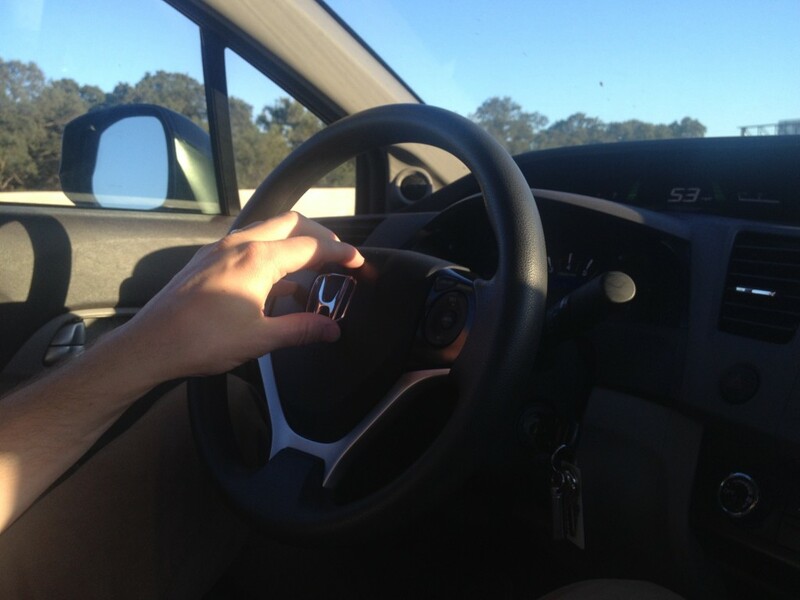 The key here is holding the steering wheel at the top, slightly to the right of the top of the wheel, with your left hand. This hold looks like the cool hold but it’s not. This steering wheel hold means business. You are very bright and can hold a scalpel like a pro. 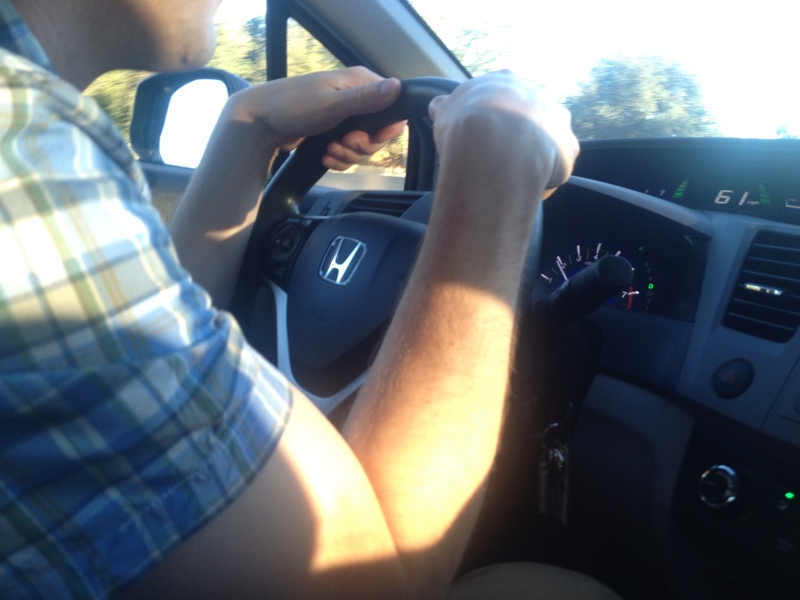 I just realized this is the first time my arms have been photographed for this blog. I probably wouldn’t make a great nurse, as you can see from my poor attempt at mimicking this hold. See #6 heading for all you need to know about this hold. 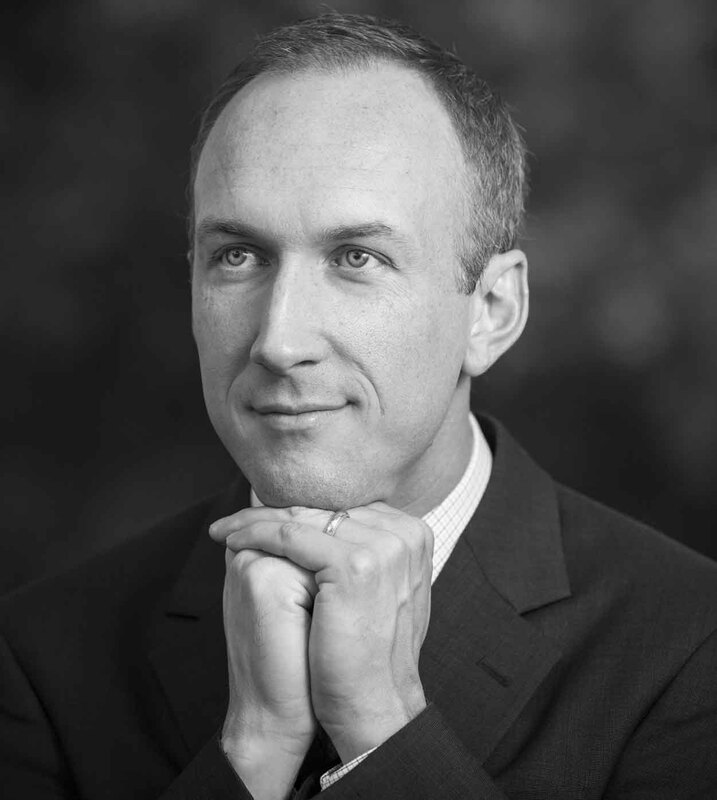 If you’re unsure what you just read, stop here and sign up with Arthur Murray or similar local ballroom dance instructor. It looks like I’m flexing here but I promise, I’m not. If you want to stop reading soon, just subscribe to my blog by email by scrolling down to the bottom of this post. 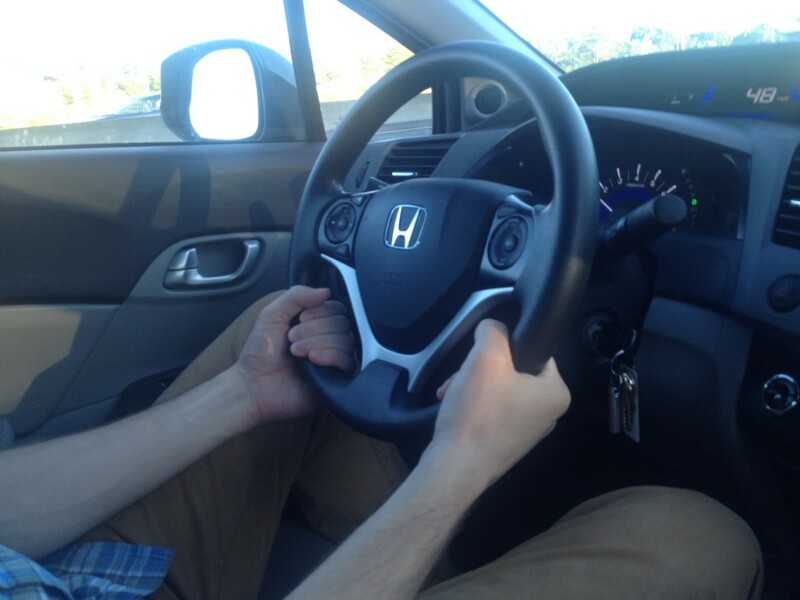 Notice how the hands are slightly apart and the chin is closer to the wheel than any of the previously mentioned holds. 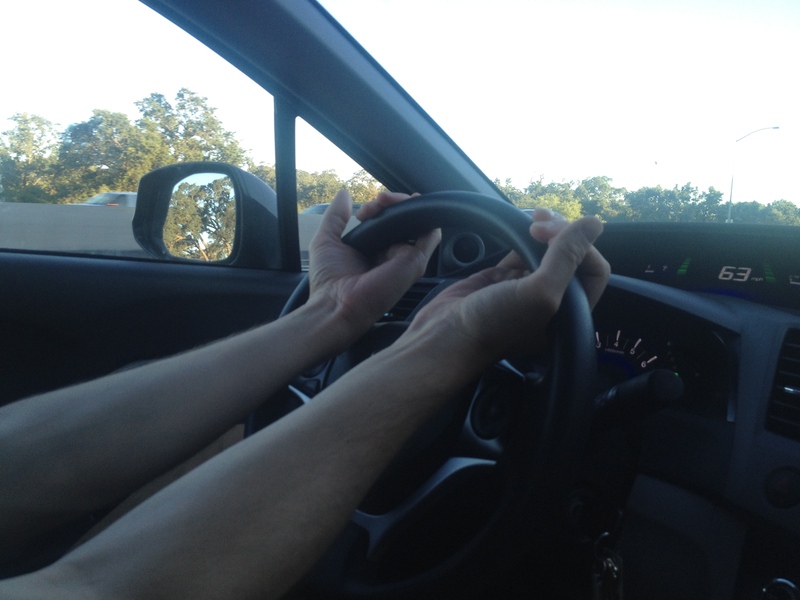 A mathematical formula can be used to determine anxiety level with this hold, where the smaller the number the more anxious the driver. 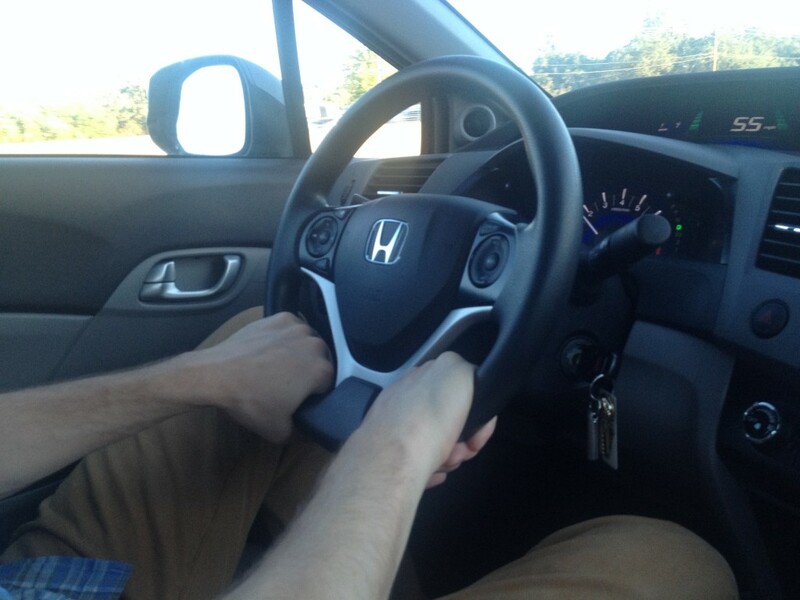 In this image, hands are 2.5 centimeters apart. 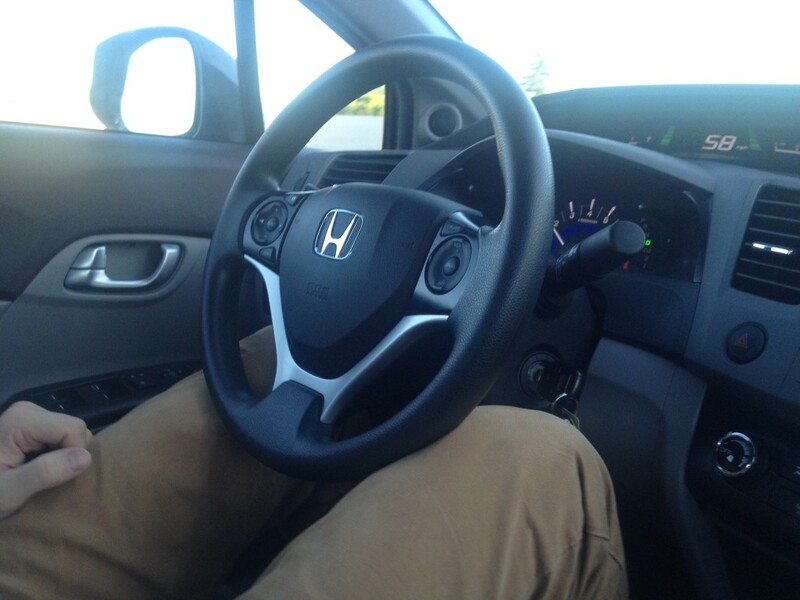 Chin is 15 centimeters from steering wheel. 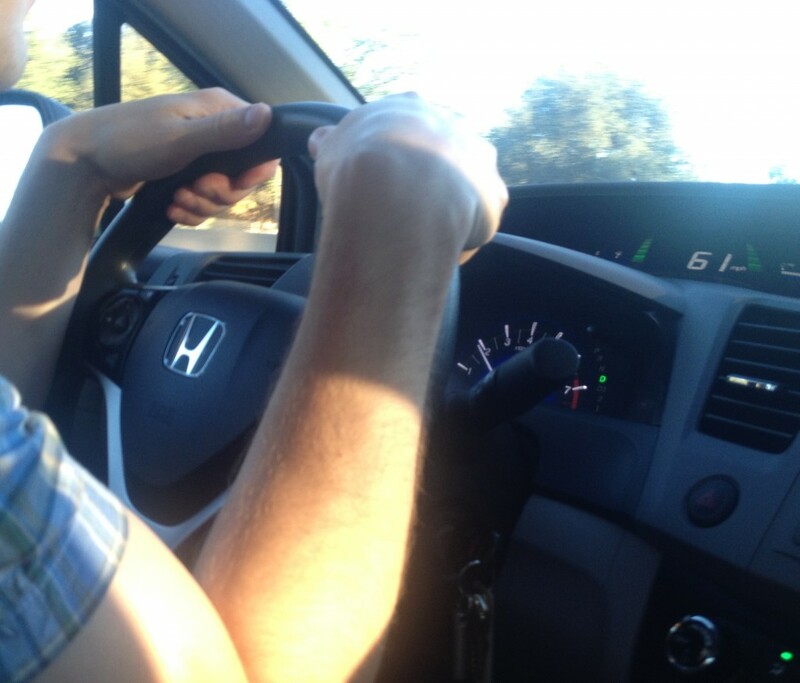 Therefore, this driver is 2.5 + 15 = 17.5 centimeters anxious. If you are 20 centimeters anxious or less, you may have an anxiety disorder. You also may not. With the shadow on my right bicep, it makes me look pretty buff in this image, which is good, because I’m worried I have an anxiety disorder in this image, which is not good. Notice how hands are even closer together than in the Anxiety Hold description above. But this isn’t anxiety. It’s pure laziness. 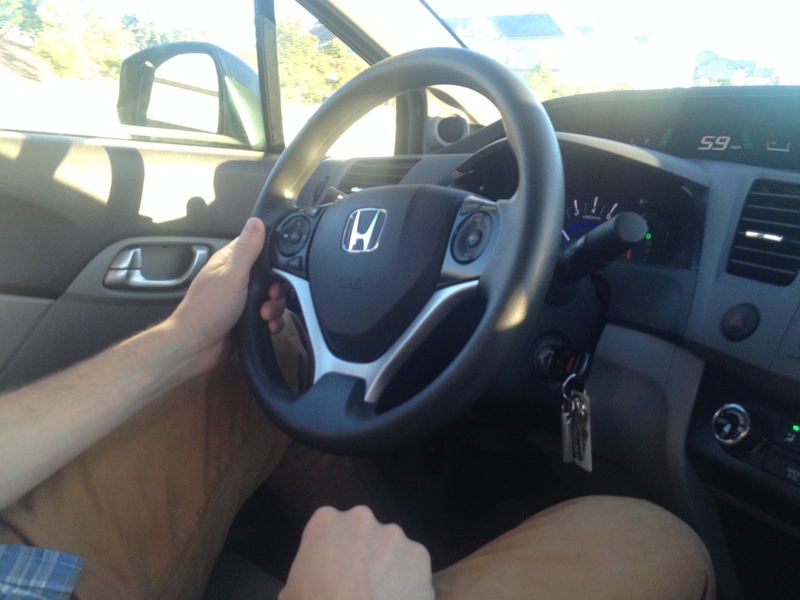 The Lazy Hold is marked by the hands just resting on the steering wheel as if they’re taking a nap. I promise I wasn’t flexing in this image either. Also known as the Carpal Tunnel Syndrome Hold in more technical circles, the Butterfly Hold is named after the insect that kind of looks like this hold. What do you think this says about you? Scientists aren’t exactly sure. Ouch! I’m still recovering from this unnatural holding method. What more can be said? Description says it all. One weird thing to mention. Notice how the side mirror in this image is blank and the side mirror in image #11 has a tree in it. Conspiracy? A joint study is being conducted between US and NZ researchers to ascertain the personality type of this hold. 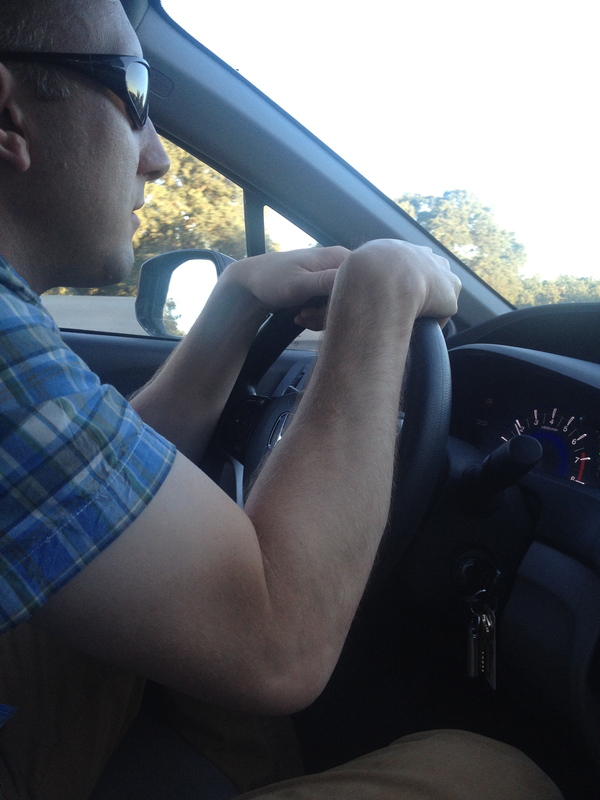 I just want to point out that I was driving 58 mph when I attempted this hold. I crashed and rolled the car a few times shortly thereafter. 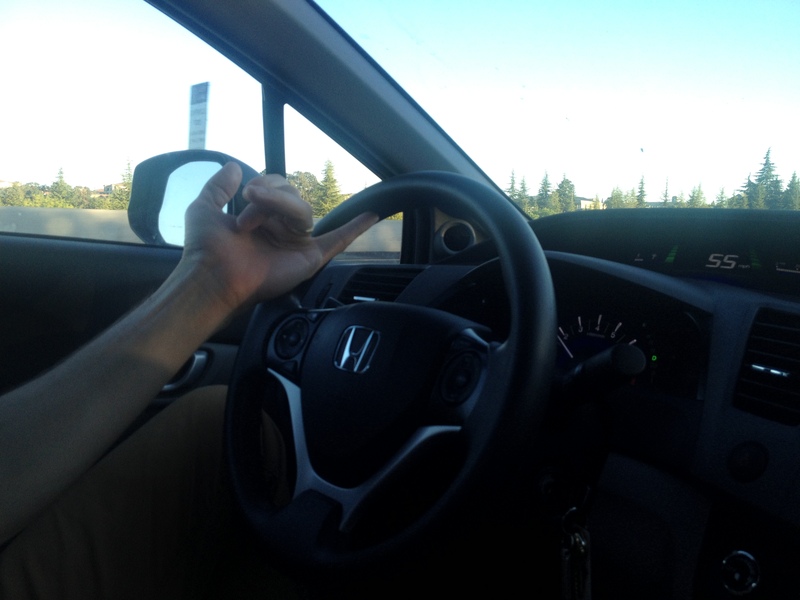 This driver can’t help but point even when no one is around. 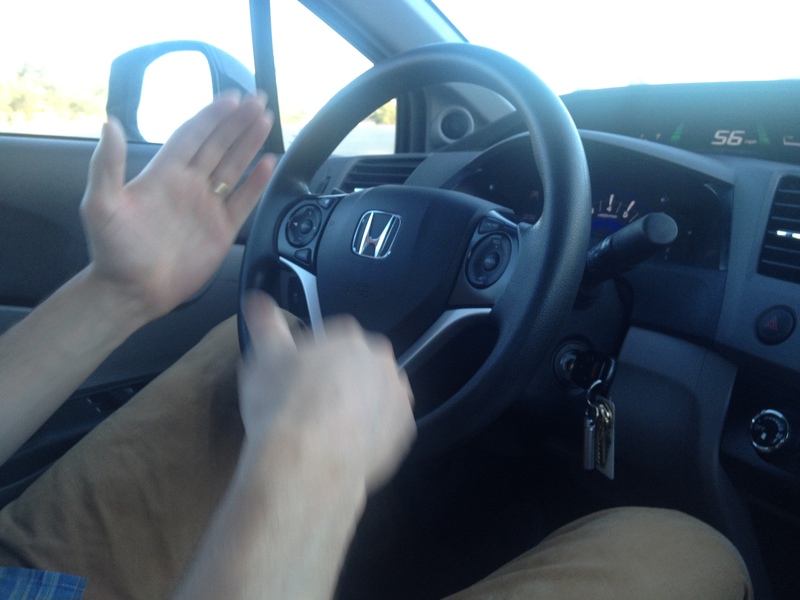 It’s a good thing my camera isn’t better at capturing still shots during rapid karate chop movements, because I wanted to capture the blur caused by the rapidity at which I was chopping the steering wheel. I was so impressed at my chopping skillz without a single Karate class! I now say “Karate” with an accent. 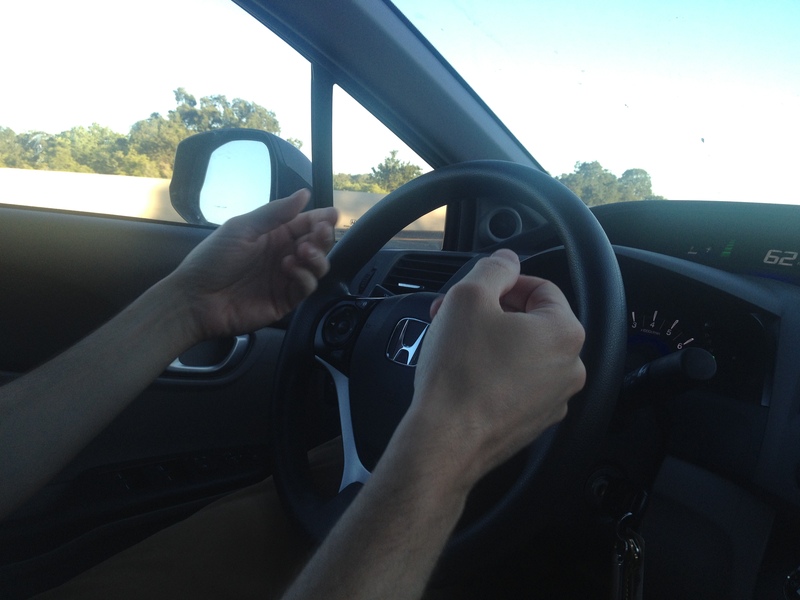 This driving method is really easy for me to write about. It consists of two karate chop holds without the chop (i.e. 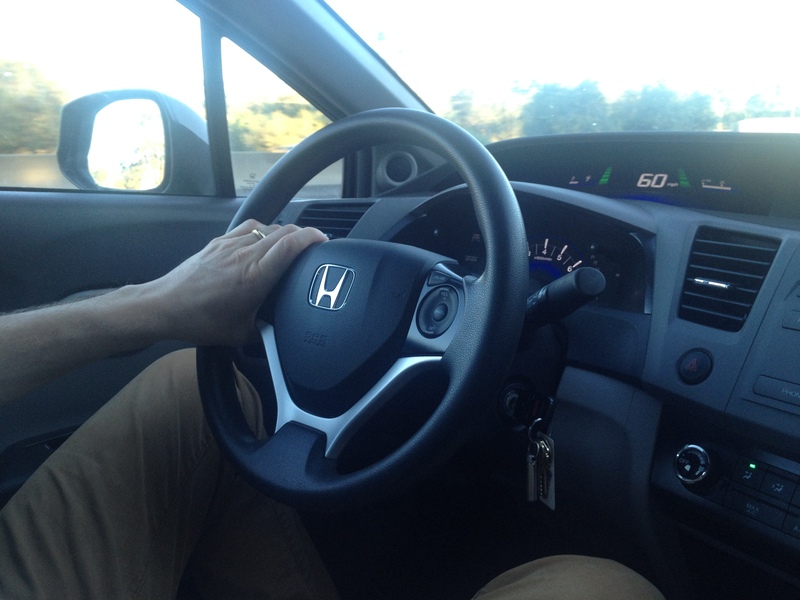 kept still) on the center of the steering wheel, indicating a unique and competitive driving style. This is the least effective of all driving methods. The car is much less responsive using this hold, and so is the reaction to the material you come up with for your blog posts. 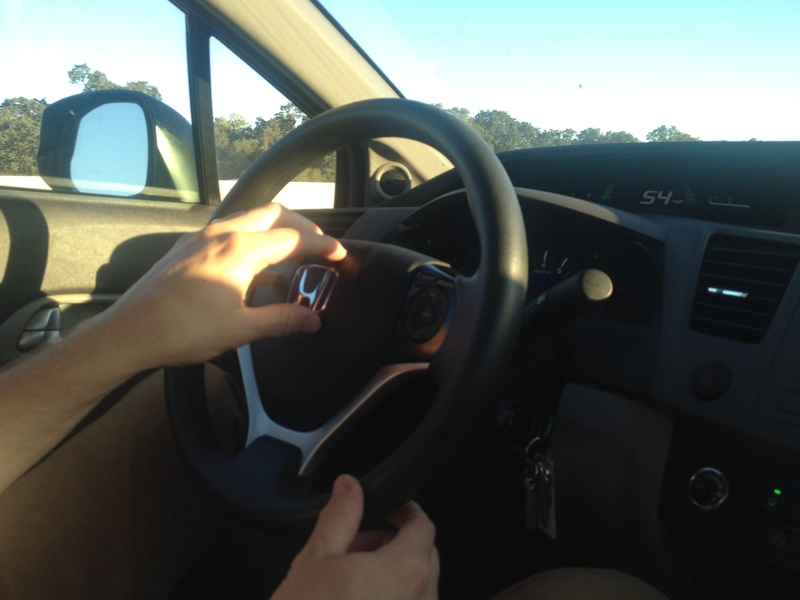 Because the thumb is pointing upward with this hold, this is one for very upbeat, positive people who wish to let their fellow passengers and fellow travelers on the roadway around them know that they are doing a good job. 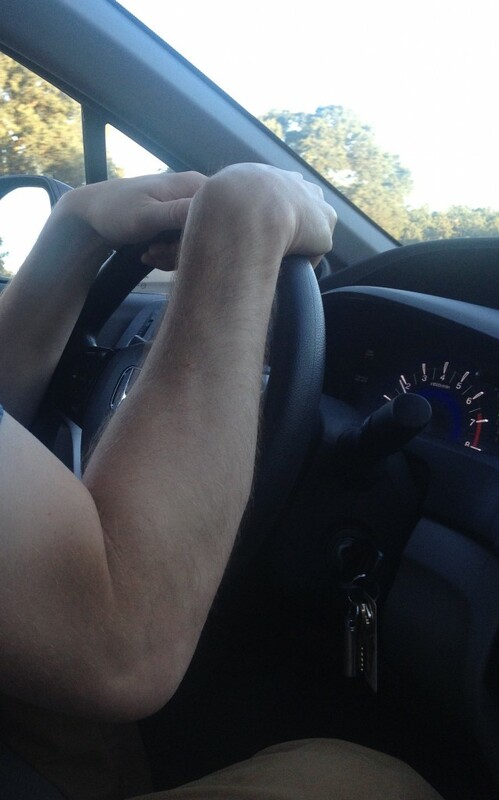 The driver who uses this hold is happy in every area of life except while trying to relax watching some TV and some inconsiderate person comes over and changes the channel to something like CNBC. You’ve done your research! The karate chop one is brilliant! I’ve always wondered how to get the greatly desired and little known gray belt! Might I suggest a 22nd entry (of course, you’ll have to add a 23rd because who makes lists with even numbers???)? The Telekinetic Hold. Power of the mind, baby. Now what does THAT say about a person? ?